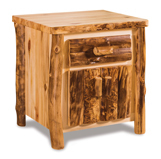 The pictured Fireside Rustic 1 Drawer 2 Door Amish Night Stand is built in aspen with natural finish. 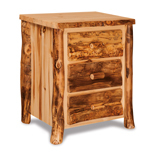 The pictured Fireside Rustic 2 Drawer Night Stand is built in aspen with natural finish. 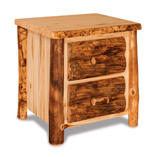 The pictured Fireside Rustic 3 Drawer Night Stand is built in aspen with natural finish. Rustic has never been so cosy! This two drawer night stand is hand built to look like it is still part of the tree. Here is a handy little nightstand with log feet and an extra spot underneath for your rustic bedroom. This simple nightstand could be just what you need to keep your bedroom stoic and calming. This nightstand has a little more drawer space but gives your bedroom just as minimalist a look as ever. A rustic bed still needs a rustic nightstand. This nightstand comes with an extra shelf. This log and twig nightstand without bark holds a bit more storage behind its twig drawer pulls. If you like how a twig looks just under the bark, this nightstand has three beautiful twig drawer pulls and twig legs. The Montana nightstand has stripped log legs and a hardwood top and shelf showing elegant lines of grain.